Sell online classes for 50% commission! Four online classes are available to students with new classes added each month. 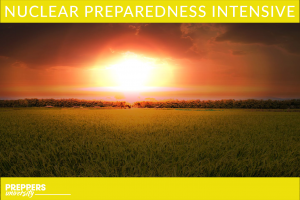 These recorded courses delve deeply into topics that continue to be in the news: nuclear warfare, pandemics, and civil unrest as well as mainstream topics for everyday preparedness — water purification and storage and food storage. These classes offer hours of recorded webinar instruction with additional printables and downloads. They can be accessed 24 hours/day with lifetime access. Once purchased, students will be instructed to set up an account at Preppers University in order to log in and access the class. From that point, they have access to the class immediately and indefinitely. These classes can be sold year-round, but we suggest keeping an eye on the news for when the topics will be most timely. You can right-click and save the graphics below to use in advertising, blog posts, and social media. We've written a few social media swipes for you here. Click on ad graphic to go to the sales page. There's no need to panic when a boil issue is ordered or some other disaster strikes your water sources. This comprehensive class provides detailed instruction for handling those situations with aplomb. You CAN be prepared to always provide your family with pure, drinkable water when you know multiple ways of purifying it, know how much to store, and have a plan to catch and reuse rainwater, if necessary. 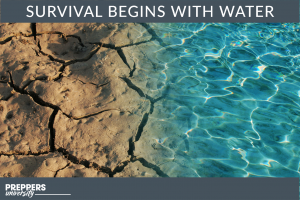 This class includes a video lesson, printables, short reading assignments and step-by-step instructions for building a Survival Water Kit. Everything is very practical and designed to help the average family become prepared for water emergencies. Every mom wants to provide her family with healthy and nutritional meals, but what do you do when a storm takes out your electrical power for days or some other disaster makes it impossible for big rigs to deliver food to your grocery store? 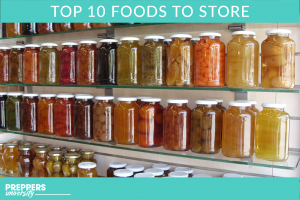 This class provides a simple blueprint for building a practical food storage pantry for every family and takes away all the confusing and conflicting advice found on random internet sites. The class includes 3 video lessons, short assignments and activities, printables, bonus downloads, and more. Divided into 7 short lessons, the information is easy to understand and apply. For this class, we brought in (Ret.) Army Major David L Jones, a specialist in the areas of nuclear, chemical, and biological warfare. Major Jones has been interviewed by The Blaze and has been a speaker at prepper expos as well. You can learn about him on his website, WMDProtection. This class includes a 90 minute webinar with Major Jones and 2 shorter webinars. Lisa Bedford teaches the finer points of Faraday containers in a 20-minute webinar, and Dr. Joe Alton, M.D., teaches how to identify, treat, and survive radiation sickness. When students finish this course, they will understand what fallout is and whether or not it's to be feared, the best places to hunker down in the case of a nuclear event, what medical supplies to have on hand that are specific to nuclear survival, and much more. This class is $29, and affiliates receive 50% commission for each sale. Unfortunately, mobs and violent riots have become a common occurrence across the country. Whether the rage is focused at statues and monuments, political events, or simply rage for the sake of rage, civil unrest is on the minds of millions. This class addresses civil unrest with 4 recorded webinars taught and provides in-depth instruction from how to identify when a group of people might become a mob to mob psychology, how to dress if you must be in an area with a protest going on, and how to get out of a mob if you find yourself at the wrong place at the wrong time. 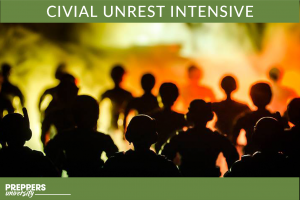 In addition to these 4 webinars, students receive a 300+ page anthology of resources to provide even more information about surviving civil unrest. This class is $29, and affiliates receive 50% commission for each sale. NOTE: This class is scheduled to be updated by mid-April, 2018. All rights reserved PreppersUniversity 2016. Great! Let us know where to send your list! GREAT! LET US KNOW WHERE TO SEND YOUR PLANNER! LET US KNOW WHERE TO SEND YOUR PLANNER!